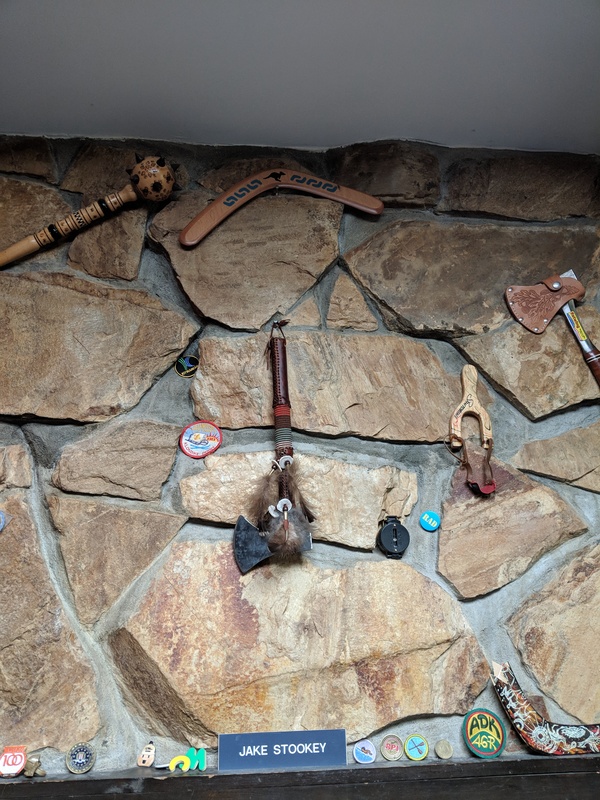 A display of weapons adorns the wall above the mantle at my house. It started when we moved in and we were given a hatchet as a housewarming gift. A screw in the wall above the fireplace begged to have the hatchet hung there. After that, other weapons quickly covered the small square of wall. Next up was a spiked club that found its way into my office when I worked at RPI after it was left behind in an abandoned research lab, likely a gift from one travelling student to another. The exhibit developed so naturally that I never realized it had developed into a 'weapons' theme until someone else pointed it out. Then came the Santorinian slingshot and several boomerangs, mostly broken, including one that my father carved by hand which had died on its maiden voyage. So it’s no wonder that I drooled with desire when I first came across the Shawangunk Ridge Trail Run/Hike series of races where the first male and female finisher in each event is awarded a gorgeous Navajo tomahawk. Suddenly I saw nothing but a gaping hole above the mantle where my tomahawk belonged. That was several years ago. Since then B and T have completed both the 50 mile and 70 mile races, and last year I suffered a glorious meltdown at my first attempt at the 30 miler. This year I would do anything to recover from various aches and pains and had decided to skip the SRT races entirely. A few days before the race in a moment of weakness, I told myself the race is a run/hike (with the emphasis on hike). I can hike 30 miles, and the course is so beautiful that there is no excuse to miss it. So I registered. Meanwhile, B and T are still recovering after running the Leadville 100 mile race several weeks ago so they too are signed up for the 30. It was great starting the race with memories of many of the intersections where it was easy to take a wrong turn. Several sandalled runners started together in the last wave. The runners in the wave all had similar bib numbers which I’m guessing means that bib numbers are roughly in order of when we registered. Someone asked why all the sandal runners were in the last wave, and we joked that runners wearing sandals are a bunch of procrastinators who wait until the last possible minute to register for races. T and I ran up the first hill playing leap frog with a group of two runners passing as many of the people in the first few waves as we could. It seemed that the four of us would be in contention for the lead. In my competitive assessment, they are running very strong but I sense a bit of clumsiness on the trail which will take a toll after 30 miles. The trail was very wet in many places with water running down the trail like a stream. Runners ahead of us were all extremely gracious in letting us run past as we approached. The runners keeping pace were pushing me to go a little bit faster than I had intended but it felt good, as it always does in the early miles of a long race. A few miles in I scooted a little bit ahead and was running alone but I regularly heard conversation close behind me indicating that I was not outpacing anyone. I ran past a dark cave. A runner with a bib stood deep within the cave looking dazed. I asked him which race he was running. After a long pause he said, “this is a great place to take a video” before eventually understanding my question and responding that he was running the 70 miler. The guy looked like he could use a pacer at that point, someone to tell him to keep focused on moving forward, not deeper into the selfie cave. I passed a few other runners from the 70 mile event. One told me that I was the first 30 miler runner who had come through. Another was wearing Vibram Five Fingers who I had seen last year in the same area. Several of them looked to be in rough shape, having run all night and being 45 miles into the race. Then things got weird. About 7 miles into the race, there is a steep climb up a cliff. Near the top of the cliff stood a runner looking completely wrecked and out of it. He was just standing on a ledge and told me, “this is my first time running the 30”. Could that be possible? Was he really running the 30 and was that wiped out so soon? Did I mishear what he said? Is he a ghost from SRT past? Rather than dwell on it I just kept going. Immediately after summitting the steep rock face is an area with dirt roads and trails heading off in all directions with very little signage indicating which way to go. I followed my nose. This is where all hell broke loose. I’m running along, leading the race as far as I know, when I see the two runners who were contenders plus one more running towards me. We all look at each incredulously. I get lost so easily I just assume I’m the wrong one and turn around and follow them. The group drops their packs and sits down just as I see T up the hill yelling “what are you doing? It’s this way!”. T has an excellent sense of direction and a GPS watch with the course map telling him when he’s off-course. I turn to the other runners and say “it’s definitely this way” but they are settled in pretty comfortably and don’t make chase. This is the last I see of them until the end of the race. T and I run together for the next two hours. It’s great. We are both having an easy time of it. We get confirmation from the first checkpoint that we are in the lead. We are not overexerting ourselves. We have all the time in the world to plan out how we’re going to deal with the competition aspect of the race. At the rate we’re going it seems as though we will cross the finish line together if we don’t force the issue. Both of us would rather take it easy for now, but eventually we will need to switch into race mode. For me personally, I don’t feel like I’m trained for 30 miles. I have about 10 good miles in me and I’m happy to save most of those for the end of the race if I can. Then a small disaster strikes. T’s sandal breaks. He gets it patched up but I don’t think is 100% after that. We reach the area where I suffered my meltdown and gave up on the race last year. It was amazing to recognize that it was, in fact, a very difficult part of the race with steep climbs. I couldn’t believe how short the section was. In 15 minutes we blazed through an area that took me an hour last year. In retrospect I should have not given in like I did and just persevered. After a few steep climbs I go on alone, nervous to be navigating in my own unreliable way. The trail is thick with memories from last year. I enjoyed the long stretch where Tom pulled me along after falling apart. My pace oscillates between a harder effort and an easier one. What I learned from last year is that I shouldn’t try to hammer the entire race. It just too nice not to slow down and take in the views once in a while. I run across a grassy field and almost step on a huge black snake. I am usually easily startled by snakes, but this one is so starkly contrasted with the green grass that it doesn’t take me by surprise. The last several miles of the race are great. The trail becomes less technical and more downhill. This is what I’ve been saving up my energy for. Rather than use my energy to slow down on the descents I just let go and move my legs as fast as gravity asks them to. It has been a long race and I am not feeling great, but the knowledge that if I push hard it could be all over soon keeps me motivated. I walk the steeper uphills, and regularly stop to stare at a map on my phone to make sure I stay on course. The last half mile is flat and runs across a huge scenic bridge. I did not expect to have a chance to win a tomahawk this year, but knowing that it is now within reach motivates me to run extra hard to make sure no 30 milers sneak up behind me. For all I know I may never have an opportunity like this again. I cross the finish line and take a much needed breather. Everything hurts. It is a slow process to build up an appetite, but meanwhile I enjoy talking to other finishers, including the winner of the 70 mile race. 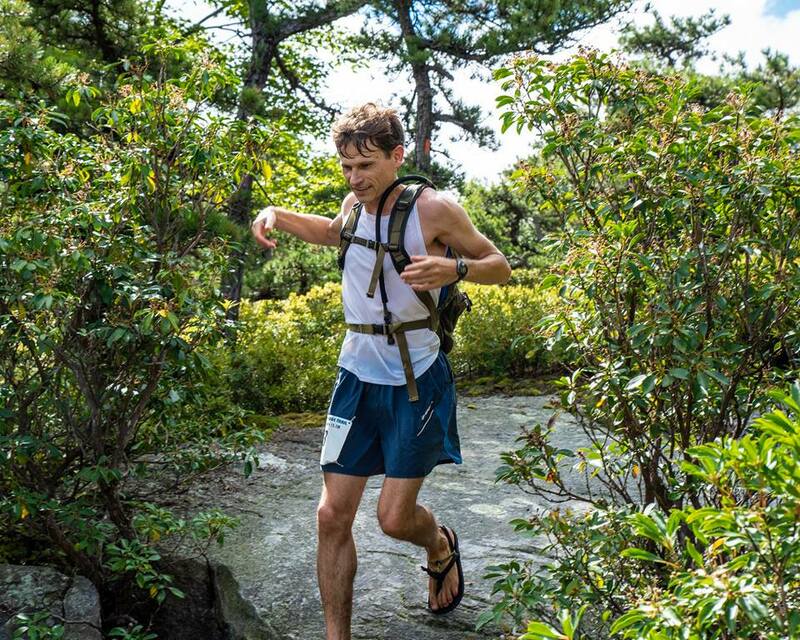 He is originally from the area, but now lives out west where he was signed up for a 100 miler that was cancelled due to forest fires so he signed up for this race at the last minute and ran this instead. Meanwhile, more runners arrive. It turns out B, T, and I, the Clifton Park sandal runners, take three out of the top four places in the race. A few odd feelings strike me after the race is over. It’s absurd, but I can’t help but feel like a slacker for only running a 30 mile race after my friends are finishing 100 milers. Also I am almost disappointed at losing the future goal of winning a tomahawk. In my mind it was going to be a long-term humbling bit of unfinished business that would always be in the back of my mind. This year I was not in top shape, but some of the faster runners from previous years did not run the 30 mile event. So there was a fair amount of random chance involved in getting the tomahawk rather than intense struggle. Did I truly earn the tomahawk? I think I still owe it to the race to throw down an all-out effort one of these years. On the other hand wow. Just wow. What a great life to have the good fortune and health to be reasonably comfortable showing up and running an amazing 30 mile trail event. And to have like-minded friends who help push each other into these ridiculous adventures.